228 pages | 26 B/W Illus. 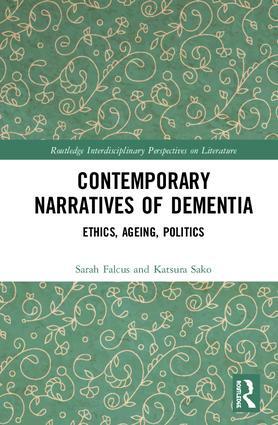 This book examines narratives of dementia in contemporary literary texts, studying what is now a pressing issue with deep political, economic, and social implications for many ageing societies. As part of the increasing visibility of dementia in social and cultural life, these narratives pose ethical, aesthetic, and political questions about subjectivity, agency, and care that help us to interrogate the cultural discourse of dementia. Contemporary Narratives of Dementia is a seminal book that offers a sustained examination of a wide range of literary narratives, from auto/biographies and detective fiction, to children’s books and comic books. With its wide-reaching theoretical and critical scope, its comparative dimension, and its inclusion of multiple genres, this book is important for scholars engaging with studies of dementia and ageing in diverse disciplines. Sarah Falcus is a Reader in Contemporary Literature at the University of Huddersfield, UK. She has research interests in contemporary women’s writing, feminism and literary gerontology. She is the co-director of the Dementia and Cultural Narrative (DCN) network. Katsura Sako is an Associate Professor of English, at Keio University, Japan. Her main field of research is in post-war/contemporary British literature, and she has particular interests in gender, ageing and illness. She is a member of the steering committee of the DCN network. Katsura Sako is Associate Professor of English, Keio University, Japan. Her main field of research is in post-war/contemporary British literature and she has interests in gender, ageing and illness. She is a steering committee of the DCN network.